Without action, climate change will affect our families in some pretty extreme ways. 1. Health: The overall health effects of a changing climate are likely to be overwhelmingly negative. Climate change affects the basic needs for good health- clean air, safe drinking water, sufficient food and secure shelter. A few of the already known impacts may enhance the spread of some diseases. Insect-borne illnesses are spreading, and asthma and allergy season are getting longer. Also children’s lungs are more vulnerable to the smog that is caused by higher temperatures. 2. Food: Agriculture and fisheries are highly dependent on specific climate conditions. Climate change is already affecting the global food supply and could threaten global food security. The rate of increase in crop yields is slowing -- especially in wheat -- raising doubts as to whether food production will keep up with the demand of a growing population. And ocean acidification affects seafood populations. 3. Places we love to play and the animals we love: Climate changes and its impacts affect nature in a variety of ways. A changing climate is likely to worsen many of the threats to forests, such as pest outbreaks, fires, and drought. Coasts are sensitive to sea level rise, changes in frequency and intensity of storms, increases in precipitation, and warmer ocean temperatures. The oceans absorb CO2 leading to acidification. Rising acidity means an inhabitable ocean for the creatures that live in it. 4. Immediately after the the People’s Climate March on September 21st, world leaders are coming to New York City for a special summit on the climate crisis. UN Secretary General Ban Ki-moon is urging governments to support an ambitious global agreement to dramatically reduce global warming pollution-- and we need to support that call with our voices, our feet, and our presence on September 21st. We are inviting fellow parents and families to stand up for the health and well being of our kids and communities. We’ll join together in an historic march to call on world leaders to take bold, global action on climate and clean energy. Our goal is to organize tens of thousands of kids, parents, and families to join this peaceful call for global climate solutions. Parents and Grandparents-- Grab the stroller or scooter, and bring your kids! Kids-- bring your parents! Help push our global leaders to build the world our kids to build the world our kids deserve-- one that is powered by energy that is kid safe and climate safe, where our air and water is clean, and where our communities are healthy. Parents! Sign up to be the School Captain and enter to win $5,000 for your school. The People’s Climate March is on Sunday, September 21st. 11:30 am at Columbus Circle, there will be a designated Parents, Kids, and Families block. Kids-- want to save the world? Dress like superheroes and animals! UPDATE: I heard from Chancellor Fariña this (Friday) afternoon; she writes that an additional 2nd grade class will be opened. Congrats to the parents -- and especially the 2nd graders at PS 85Q. Class sizes last year in the early grades have steadily grown and last year were the largest in 15 years. Unfortunately, the de Blasio administration has done nothing to reverse this damaging trend -- despite specific promises he made during his campaign --and refuses to allocate specific funds either from the state or the city to reduce class size. The UFT contractual limits have also gone unchanged in 40 years -- though a few years ago, the DOE stopped recognizing a "side agreement" to cap class sizes at 28 in grades 1-3. As a result the number of children in classes 30 or more have ballooned in these grades. Here is a letter from a parent leader I received today. I fear more such reports once school starts. 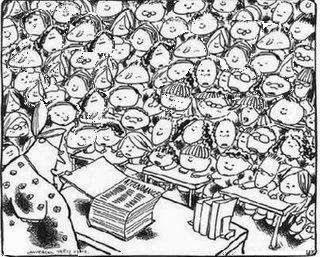 Attn: Chancellor Fariña, Class Size Matters, NYC City Council, et. al. My name is Randi Marshall and I am a parent at PS 85Q in Astoria. I have recently learned that the DOE has decided that our 2nd grade classes should be 36 and 35 students respectively - with no teaching assistant, despite UFT guidelines that say 32 is the absolute limit. This is completely unacceptable and will set our children up to fail. It will create a chaotic learning environment, where no teacher can truly teach and no student can truly learn. The principal of PS 85Q was prepared to create a third general education second grade classroom to allow for smaller class sizes; she even selected a new teacher, who has set up her classroom. But just this week, our principal learned that the DOE would not be approving the budget needed for that additional classroom, and that due to arcane and ridiculous rules, the school would not be able to have that additional classroom unless there were a total of 80 general education 2nd grade students (we currently have 71). So, basically, the DOE is suggesting that officials believe that class size is okay unless it was as high as 40 (!!!!!!!!!) children in each classroom. Can you imagine teaching 36 or 39 or 40 children in a single classroom with no aide? What child is going to learn in that environment? They don't even have room to write - or hang their coats - or sit on a rug for morning routine. They won't be able to raise their hands to answer a question because the teacher will barely be able to see them. They are seven and eight years old. They deserve better. New York City has promised for the last SEVEN years to REDUCE class size, under the Contracts for Excellence laws. DOE received funding in exchange for those promises. And now the DOE has asked PS 85Q to hold two classes that are amongst the highest - if not the highest - it has seen in those same seven years. The Contract for Excellence suggested that the class size goal for 2nd grade by 2011 should be 19.9. That's 20 students - compared with the 36 you are now asking a single teacher at PS 85Q to teach. This is far from the "appropriate" education our students are promised in New York City. PS 85Q is a tremendous school. But it can only continue its fabulous work if you don't stand in its way. We must do better by these children. Please give our principal the opportunity to give these children the appropriate education they deserve. Please allow PS 85Q to open the additional classroom it had been planning - before the school year starts - to continue its amazing educational efforts. Please don't wait - because once these children start their education, you will only disrupt them further if you make the right decision but it is too late. I ask, I beg you in the DOE, the city council and our local District 30 office to make the right decision and do what you can to allow our 2nd grade students to thrive - not fail. And please act quickly. I look forward to your reply - and this wrong being righted - as quickly as possible. As you can see, the number of “non-participating” NYC students appears to have ballooned four times or more since 2013, so it was unlikely to be explained away by truancy or simple absence. Stephen also told me that the state was holding firm, despite the fact that the city was arguing that less than 2,000 students had opted out, according to their data. State Education officials were scrambling to determine Friday why test data appeared to show more than 20,000 city students did not take math and English exams…. The figures were more than triple the previous year’s numbers. State officials suspect there was an error in the way a large group of city students were coded in the state database of third- through eighth-graders who took the tests. My response to all this: with such erratic and unreliable information, how can anyone trust any of the test score data from NYSED? I admit to being discouraged by the sadly ritualistic appearance of Mayor de Blasio and the Chancellor Farina, celebrating the small increase in scores in the city based on these highly faulty and unreliable exams as evidence of progress. The Mayor was even moved to give credit to Bloomberg for his support of Common Core and his supposed “investment in our schools”, though school budgets have been cut to the bone and we have the largest class sizes in 15 years. Before the new Common Core tests, we had ten years of state test score inflation in NY that was obvious to anyone paying close attention, but year after year was ignored by the powers that be, because it was politically convenient. Each year Mayor Bloomberg and Chancellor Joel Klein, sometimes accompanied by Randi Weingarten, would ritualistically bow down to the supposedly infallible test score gods and celebrate the results as showing that their reforms were working. And then the entire imaginary edifice came tumbling down in 2010, when the educrats finally admitted that an enormous test score inflation had occurred, somehow without their knowledge and complicity. It is too early to assume that the small rise in test scores this year were due to similar manipulations , but a decade of experience should teach us to be open to the possibility. Merryl Tisch predicted that more kids would pass this year – and they did. In any event, we have overwhelming evidence from teachers and principals that the tests were poor quality and a lousy judge of real learning. The state’s release of data showing thousands of opt outs in NYC is just one more piece of evidence showing how skeptical everyone should be about any data our government officials supply. These tests were designed to show that the majority of students across the state are failing, and are wrongly aligned with NAEP proficiency levels that were never meant to signify college readiness. Indeed, the test scores feed into a narrative of failure that is being manufactured by the privateers to attack job security for teachers and expand charter schools. They are central to a “shock doctrine” strategy, engineered to make parents believe that their children’s schools are deficient, to enable privatization and instruction to be outsourced to corporations. Whether test scores go up or down, parents should beware not to drink the Common Core Kool-aid and allow themselves to be convinced by faulty data -- either produced by incompetent bureaucrats or skewed for political ends.